Some of the best snorkeling and diving in the world can be found in America's national parks. From Alaska to the Virgin Islands, extraordinary opportunities to explore the underwater world await you. Swim alongside colorful fish, explore sea caves, reefs and kelp forests, or dive in serene seagrass meadows and alongside mangrove forests. Along with these natural wonders, there is a wealth of human history to discover beneath the waves. Shipwrecks from centuries past stand as testaments to human struggles with the power of our Great Lakes and oceans. Some parks have designated snorkeling trails, while others provide guided dive or snorkeling tours. Channel Islands National Park even offers opportunities to explore the underwater landscape without getting wet, through the Channel Islands Live program! Be sure to check with specific parks for safety, environmental, and shipwreck protection regulations. This will help you have a safe visit and keep these areas pristine. 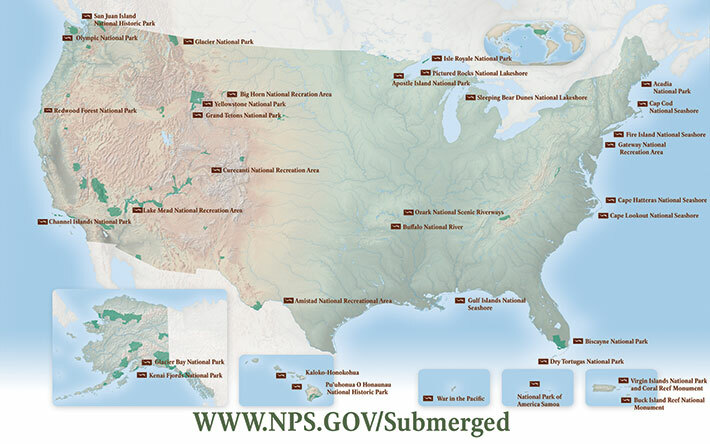 Almost all of the 61 National Park Service areas with significant water holdings are of some interest to divers, although scuba diving receives little publicity. This guide is intended to introduce the more than four million divers in the US and others interested in watersports, to a dimension of their parks they may have overlooked. The activities described here are inherently hazardous and should only be engaged in by physically fit and experienced divers. All risks of injury are assumed by individual participants, who are responsible for taking appropriate safety precautions, and using appropriate equipment when diving.